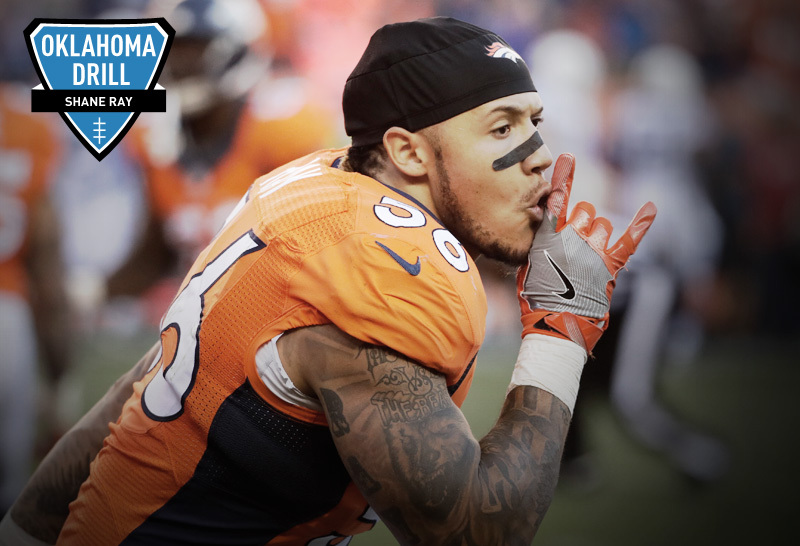 After falling into the bottom portion of the first round in the 2015 NFL Draft, Shane Ray has played with a chip on his shoulder. But the second-year Broncos linebacker made a statement during his first career start in Week 3, sacking Cincinnati's Andy Dalton three times. Ray has been an influential part of Denver's fourth-ranked defense and gives a lot of credit to teammates and fellow pass rushers Von Miller and DeMarcus Ware for helping him improve since entering the league. Ray discusses his breakout game, the defense's recent struggles against the run and playing against his hometown team and childhood favorite Kansas City Chiefs. Plus, he reflects on what he learned in the draft process. Von [Miller] and DeMarcus [Ware]. [They've helped me transition to the NFL] by constantly critiquing me, helping me out, giving me knowledge that I didn't have. Of course, they've been in the league awhile now, so they know things that I didn't know as far as diet, taking care of my body, recovery stuff, chiropractors, all that. I gather so much information from their schedules and put it into mine, and they help me a lot. His presence. Aqib [Talib]'s presence on the field, he's real aggressive, so you kind of see him always around the ball. I'm not saying there's been a drop-off in our defense 'cause [Bradley] Roby is always around the ball making plays. But Aqib is a veteran, so you know he's going to have his technique, or whatever he's going to do, on point. He performs and he delivers. Collectively -- offensively, defensively, special teams -- we're just better [than the other AFC West teams]. Defensively, our numbers speak for themselves. When our offense is rolling, the kind of effect it has on the defense is evident. [The offense] keeps us fresh so we can shut teams out. We're the best. We're better than them. Just win the rest. That's the only option we have. If we want to control our destiny this season as far as the playoffs and home-field advantage, we have to beat everybody. So our mentality is beat everybody. I was excited, actually. I was excited because it was my first start and I wanted to ball out. My mentality was I've been waiting for this opportunity for a really long time and I'm going to take full advantage of it and make the most of it. I feel like I did that. [Getting three sacks in my first start] was kind of an "I told you so" moment. Like I knew this is what I could do when I got the opportunity. Of course, everybody looking from the outside in wants to see, Can he ball or play at the NFL level? And for me, I felt like I'm saying, "Nothing's changed. I'm still dominant." I would love to sack ... Let's see, I've kind of got a shot at all the good ones. Oh, Alex Smith. I want to sack Alex Smith. I have not sacked him. I was a Chiefs fan growing up. I look at it as an opportunity for bragging rights. Of course, I'm a Denver Bronco, but all of my family and friends are Chiefs fans. For me, when I can get two wins on the Chiefs per year and come back home, go to my barber shop and make all the Chiefs fans mad, I'm cool with that. That's what it's about. Fix a lot of little things. I think the problem [the defense has] had in the run game is not as far as the personnel and the talent. It's more the technique and staying in our gaps. In the defense we're in, everybody has to be in the right place for our defense to work. If one guy is out of place, it can create a lot of seams, and I think that teams have been trying to expose that. They know that if they have to pass the ball against us, it's not going to go well for them and they can't control the game that way. 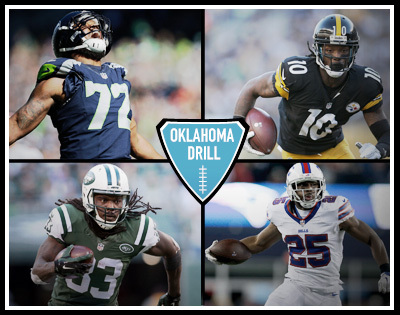 They've been trying to control the game in the run game, and we just have to step up and play physical and stop guys from running the football. If we stop guys from running the football, we win the game. It's that simple. Nobody can stop our pass rushers, and if they pass on our secondary, it's just not going to happen. I talked to Book. And when C.J. [Anderson] got hurt and [Devontae Booker] moved up to starting running back, I just told him to play like this is the last game he's going to play. Like this is the game where you have to establish yourself for the rest of your life. Just work, because we've seen what Book can do. He's a workhorse. He can move the ball and carry the offense. I just didn't want him to have the pressure of, Oh man, I'm a rookie. You never know what's going to happen in football and this is your opportunity. Take advantage of it. I think Joe Thomas was one of the toughest O-linemen that I've faced, especially being a rookie last year. He had a lot of really good technique. I mean that's why he's one of the highest paid in the league. Perry's Steakhouse & Grille. It's kind of my regular. We came in this year with a target on our back. When teams saw us on their schedule, this was everybody's Super Bowl -- to play the Denver Broncos with the best defense. They want to see what they can do against us. Of course, it's made it harder. It's made every game that we play come down to the wire, but you know it's the National Football League. That's what we expect and that's what we want, to play against the best for 60 minutes. That's the only difference, but I think we've been all right. We've handled it. 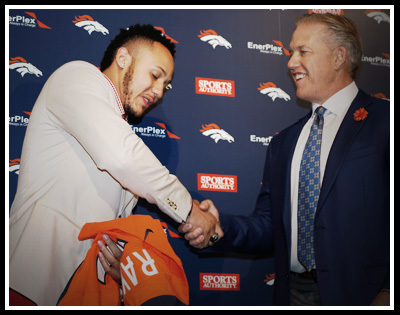 John Elway (right) and the Denver Broncos traded up five spots to take Shane Ray at No. 23 in the 2015 NFL Draft, even after he had a marijuana citation during the draft process. (David Zalubowski/Associated Press). It kind of let me know that [the Broncos] were dedicated to me as a person and a player. They were giving me the opportunity to come in and play still, even after what happened with the draft. I think it said a lot. They traded up for me, too, and let me know that I was a guy they really wanted and valued. It's worked out. If something happens along those lines or anything [in the draft process], just stay positive. Everything is going to work out. And even if it seems like it's dark and you don't know what's going to happen, stay true to yourself as a person because you know who you are. Don't let everyone else's opinion of your situation or what happened really alter your personal dedication to what you're doing. I'd have to say Markus Golden from the Arizona Cardinals. We played together and he had a speech one game [in college]. It was funny, but it was just so intense because if you know the kind of person he is and how emotional he is, he just pours it all out. The speech he gave was serious and he got everybody ready to go. Without a doubt. When we practiced with San Francisco, they got off the plane and came to practice and they were gassed. They were all exhausted because getting used to the altitude takes at least a month to just kind of breathe normally. I mean, I take an inhaler every day because I have respiratory issues already, so out there, it makes everything more difficult. Von does a great job of putting himself into everything that he's done. The personality that everybody sees is really who he is. There really isn't much that I haven't seen that everyone else hasn't. He's hilarious, I know that. Probably one of the funniest people I've known in my life. We feel, as a defense, that we should be giving our offense as many opportunities to touch the ball as possible. That comes from getting three-and-outs and stopping drives, and that gives our offense more time of possession. I would say that if we do our job, we not only give our offense the ability to score more points, but keep their offense off the field and keep ourselves fresh. It's kind of a win-win for us. We like to practice every play like this is the one that's going to get us off the field.